There are times when saying what something isn’t is more helpful in understanding it. We posted the first EMDR blog (click here) conveying what EMDR is and how it helped out Cameron with her struggle. Now let us share some of the myths of EMDR and misconceptions that might prevent people from exploring this useful tool. The client is awake and alert during the entire session. The client has complete control of the entire session. Many safeguards are put in place so that, in the event someone does want to stop (which is an anomaly) they are able to do so at any time. The therapist cannot “make” the client do anything they do not want to do. EMDR does not recover repressed memories. The brain is doing only what it is able to and feels comfortable doing. I know this sounds strange, but our brain is a fantastic protective tool. EMDR only assists the brain in reprocessing unstable processed memories. If the brain has locked away a memory, it has done so for a reason. This therapy will not unlock something that it is not ready for. Only time will do that. I have never had a client randomly unlock repressed memories through reprocessing that they were not working to try to remember in the first place. The reprocessing phase does not start in the first session. I have many clients anxious that they will be forced to relive their trauma in the first session. This is in no way true. It is a multi step process. There is a foundation that sets up a safe space by doing a thorough history before moving on to the reprocessing itself. The client feels comfortable with the therapy before it begins. EMDR is not just for severe trauma. It can be used to work through anxiety, OCD, depression, and other maladaptive behaviors. These behaviors started somewhere and the belief is that if we return to where they started, they can be changed through that reprocessing. It does not have to be a PTSD situation. EMDR does not have to be the only form of therapy used in session. I have many clients that jump back and forth from session to session. People’s lives go on. If something comes up between sessions that needs to be addressed, we can do so and return to EMDR at a later date. There is no rule that applies as to how often EMDR sessions have to be done. In the time I have been doing this therapy with clients, I have found amazing results. My clients that have gone through the phases of EMDR have left with increased awareness of how their past has contributed to their current problematic behaviors, relationships, and poor coping tools. It gets them thinking about ways to make changes in their lives. I have yet to find another form of therapy that has the ability to elicit this type of change in the short period of time that EMDR does! 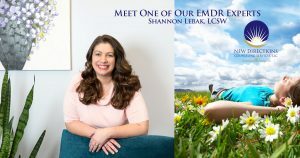 Interested in EMDR? What to find out more? Contact New Directions Counseling Services and one our experts Shannon Lebak, LCSW for more information. 724.934.3905 or click here.